Every woman deserves to feel self-assured and happy with her body. But if you are bothered by the appearance of your breasts, it can be difficult to feel confident in yourself and your appearance. 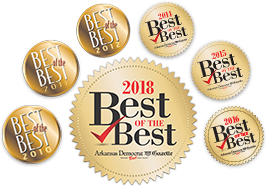 Dr. Rhys Branman understands just how much this can impact your self-esteem, because he’s helped hundreds of patients like you boost their feminine curves and their confidence through breast augmentation surgery in Little Rock. Whether you’ve always felt self-conscious of your naturally small breasts, or you’ve noticed loss of volume and shape after pregnancy, weight loss, or the natural aging process, expertly performed breast augmentation can help you feel confident in your appearance every day. When performed by an experienced cosmetic surgeon like Dr. Branman, breast augmentation is a straightforward procedure that offers dramatic improvement without excessive discomfort or downtime. Our patients typically return to work within the first week and are enjoying their final results within a few months—and with advancements in surgical techniques and breast implant options, recovery is becoming shorter, more comfortable, and less prone to complications. The decision to have breast augmentation is a deeply personal one that should be made by you alone, with the guidance of a board certified cosmetic surgeon. How Much Does Breast Augmentation Cost in Little Rock? Breast augmentation prices begin at $3,900 for saline and $4,900 for silicone implants. Your total fee depends on your personal surgical plan and includes your breast implants, surgeon’s fees, operating room costs, and checkups before and after your procedure. We’re proud to offer several affordable financing options for our patients! Our knowledgeable office staff can help you select and apply for a plan. During your consultation, Dr. Branman will evaluate your health, your natural body dimensions, and the condition of your breasts to determine the most beneficial option for you. You can also discuss your preferences for breast implant size, type, and shape. Dr. Branman may also discuss whether or not a breast lift might achieve the best result. With more implant choices than ever to achieve the right size, shape and fullness, the knowledge and skill of a cosmetic surgeon with 20 years of experience, and the helpful support of our Little Rock Cosmetic Surgery Center staff, you can enjoy the beautiful breast contours you’ve always wanted. Our breast augmentation patients tell us they have fun choosing their implants, but there are so many options that making the decision can get a little overwhelming. We are here to help. Dr. Branman is experienced with both silicone gel and saline implants, so he can explain the advantages and disadvantages of each. If Dr. Branman recommends a specific implant, he will discuss with you the reasons for that choice and the results you can expect in regard to size and breast appearance. Ready to learn more? Read our additional articles on breast implants! What is Breast Augmentation Surgery Like? Breast augmentation is usually performed under general anesthesia on an outpatient basis at our accredited Surgery Center, which is staffed with experienced, qualified nurses and anesthesia specialists for your safety, or at a nearby hospital. The surgery takes approximately one hour to perform. Through an inconspicuously placed incision, Dr. Branman will create a space for your implants and place them in an ideal, attractive position. Once the desired results have been achieved, he will suture and dress your incisions, and you will be able to return home after a brief period in the recovery room. Typically, our breast augmentation patients are ready resume daily light activities within a few days after surgery. Many return to desk jobs after 4 to 7 days and can resume many physical jobs within 2 to 3 weeks. Exercise can be gradually resumed in about 4 weeks, and results are close to their final shape and appearance in about 3 months. Dr. Branman has been helping Little Rock, Arkansas patients since 1998 and he would be happy for you to come in for a consult.